Tonight was a good livin’ night. Broke out a new pinot noir–this 2009 Clone 5 Pommard–to celebrate the end of the work week from the comfort of our deck. We snacked on some favorites (e.g., olives stuffed with jalapeno peppers, cheddar/colby cheese) and broke out this red and some Miller Lites to enjoy the sunset and great temperature here in New Jersey. Buena Vista remains one of our favorite Sonoma wineries, and it’s in no small part due to great pinots like this Clone 5 Pommard. Perfect for a barbecue and outdoor grillin’. 2009 Buena Vista Pinot Noir Clone 5 Pommard, Buena Vista, Carneros, California. This bottle was a screw top (still getting used to this trend) and was promising even from the first pour. A deep lovely red, and all kinds of great berry smells wafting up even as it splashed down, inviting, into a stemless glass. I didn’t let it sit at all, simply swirled it around the Reidel for a quick second, and then took a first sip. Great stuff! I’m pretty sure I got a feel for some cherry in this mouthful, and all kinds of amazing undercurrents that you know I don’t have the palate or experience to better describe. I can say that we enjoyed this bottle with a lovely salad (arugula, onion, corn, real bacon [and cooked perfectly], blue cheese, and pepper) that didn’t even need dressing it was so good. 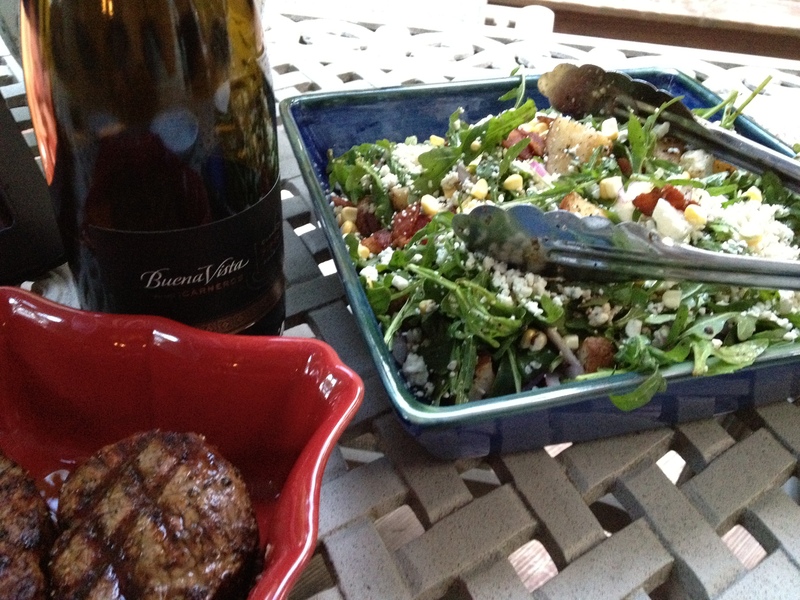 Our main course were grilled filets that helped bring out some of the character of our pinot. Wish we could enjoy ambiance and tasty treats like this every night! Not being familiar with this Clone 5 varietal, I thought I would share with you here the winemaker’s comments on it: “Our Ramal Vineyard Estate in Carneros includes 112 vineyard blocks and 13 Pinot Noir clones. Each vintage, winemaker Jeff Steward crafts small bottlings of clones that display distinct style and character. The Clone 5 Pommard shows intense aromas of red cheery, black plum, and jasmine over opulent red and black fruity with a forest floor base. Note the depth of color and remarkable intensity.” If you’re reading this post because you’re thinking about grabbing this bottle for yourself, know that I am nodding vigorously. Enjoy!